A mistake in which Search Ads Basic reports were sent to the wrong developers was linked to a "processing error," and safeguards have been put in place to prevent a repeat incident, Apple said this week. "Due to a processing error, the January monthly results email we sent to you contains incorrect app promotion information," the company wrote in an email to developer Louis D'hauwe, spotted by Cult of Mac. "Accurate performance information is always available in your Search Ads account. To ensure such an issue will not recur, all future performance communications will direct you to sign into your account to view your Dashboard." The gaffe saw strangers get data on developers' spending, install rates, and cost-per-installation (CPI). While only some people were affected, the full scope of the situation is unknown. 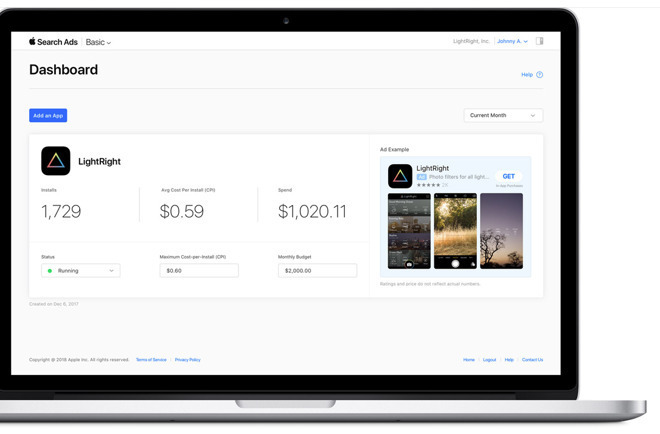 Apple introduced Search Ads Basic in December. Unlike regular Search Ads, now dubbed Search Ads Advanced, the Basic tier requires payments only when someone actually installs an app. The drawback is that developers have fewer options, and can only spend $5,000 per month —enough for small apps, but not for anything high-profile. Search Ads appear in the App Store when people are searching for downloads. A perk of Advanced is that developers can focus campaigns on things like keywords and specific customer types.